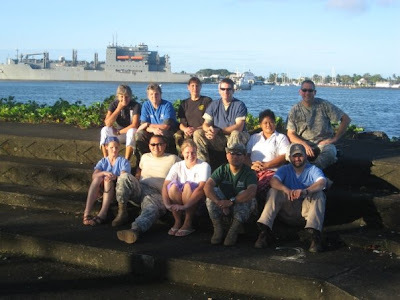 Daniel Gildea recently returned from a summer-long World Vets trip as a volunter on Pacific Partnership 09. Below is a first-hand account of his experience. On June 11th I boarded the USNS Amelia Earhart (AME), a Dry Cargo ship. To my surprise I was lead to a room with a full sized bed, a private bathroom, a desk, a flat screen television, and a window view that over the course of the next two weeks would be priceless. On the 12th the AME left San Diego Harbor for it's first international trip. Onboard I worked with, and got to know fascinating pediatricians, opthamologists, surgeons, cardiologists, physicians, dentists, plus nurses and technicians of every discipline. At this point I was one of four NGO personnel, the rest were all Navy. The group of us spent that first week organizing tons of equipment, meds and other supplies in the hull of the ship. It was hard work, but it was during this time that the group turned into a team. After nearly two weeks the AME rendezvoused with the USNS Richard E. Byrd (REB), another and nearly identical, Dry Cargo ship. Over a 30 hour period the freight from the AME was transported to the REB. This was done by cabling freight from one ship to the other and by having helicopters lift and drop freight from one ship to the next. This was also done at full speed and included the PP09 people aboard the AME being helicoptered to the REB to meet the other portion of the PP09 group that had left from Guam. The REB was the ship that be home to the PP09 members during the mission. Aboard there were doctors and participants from many other nations like Canada, Singapore, New Zealand, Australia, Japan, and Texas. Also aboard the REB were members of the US Army and Air Force...talk about a melting pot. Another week and a half on sailing to get to Samoa. When we get there we drop anchor a couple miles off the coast of the Capital city of Apia. For the first few days PP09 got ashore by taking a RHIB, think a very fast raft with hard bottom from ship-to-shore. To do so we climbed down a Jacob's or rope ladder into the RHIB. Sometimes negotiating 15 foot swells, this was one of the trips highlights. 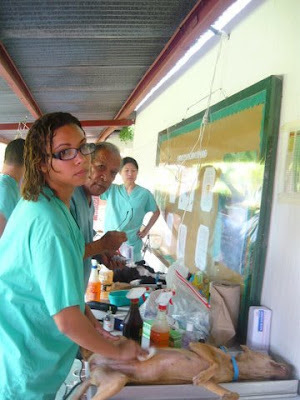 The Veterinary team in Samoa was a diverse group. PP09 had Four members of the Army in Spc. Roman Blas, Sgt. Tom Jones, Sgt Matt Jepsen, Capt and Dr. Jay Coisman. Col. Dr. Tammy Von Busch represented the Air Force. 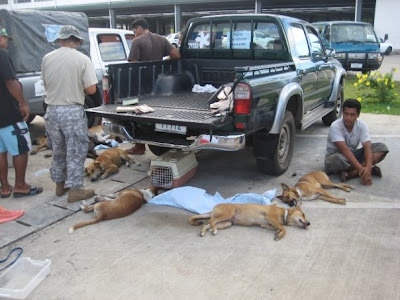 We worked in coordination with the Animal Protection Society of Samoa (APS). The APS is run by a caring and hard working group of people. Dr. Skye Turner, Dr. Hanna Siemering, Dr. Roisin Mc Quillin and Simon McIntosh a Vet Student. In Samoa we set up our surgery clinics in fales. A fale is an open-air, roofed structure similar to a gazebo. Working on both the southern island of Upolo and the northern Savaii. In all we "desexed" 193 dogs and cats, amputated a leg, pinned another, treated parvo puppies, and did countless non surgical appointments. We wormed and vaccinated everything we touched and most importantly we got to work with great folks and make friends. After ten days in Samoa...on to Tonga. After two days sailing we arrive a few miles off the of the island of Lifuka. We take RHIBs to the capital city of Pangai. Pangai is a small rural area with one main road. The main area or hub of the city is roughly 150 yards long. It has one bank, one cafe, a dive shop, a stationary store and two small general stores. When PP09 arrived traffic on the island quintupled. The first two days we spent working on mostly dogs, in a clinic we installed in a shack behind the island's Ministry of Agriculture. 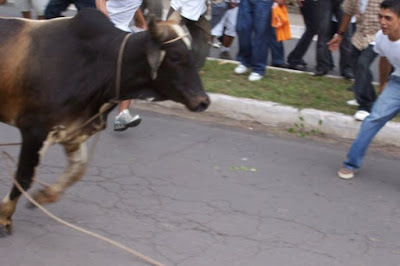 The locals were unexcited about the idea of dog desexing (I saw three cats in Tonga). They were however very excited about our treating and desexing livestock. We would drive up and down Lifuka and the neighboring island of Foa park the truck and walk into the bush. Tied to trees cattle owners tether their animals to graze. We would go to herds, in a matter of speaking, and castrate bulls, while taking blood samples, tick samples and deworming everything we could get our hands on. As an aside: on one day PP09 members taught the local farmers classes on various types of husbandry, illness recognition and prevention in the local animals. We taught these classes in the Ministry of Agriculture's main building. One of the highlights of the trip was watching as the room filled up during the first class and watching farmers grab benches and place them near the windows so that more members could listen and learn...priceless. Our mission was not just to teach the locals who were in attendance but to teach them in such a way that they would be able to teach others. We were there to "teach the teacher." We did and while we were there we got to see our lessons being handed down from one farmer to others. 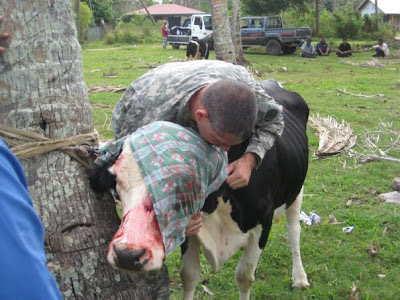 This is why there is a Pacific Partnership and why World Vets is a participating NGO. In the middle of the stay in Tonga many of us got stranded on the island as the RHIBs stopped running people back to the ship during a cyclone warning. With winds at 25-40 knots and over we were told that we would be spending the night on-island. Naturally this would be the evening where we Vet team ended the day wrestling a 350 lb mother pig who had been mauled by a dog. My clothes were a mess and I would be spending the evening and a goodly portion of the next day in them. Everyone was found a place to sleep and the PP09 crew descended on the lone car/bar/restaurant, The Mariner's Cafe and made the best of an interesting situation. Everyone had a great evening, though followed by a shaky morning and began another work day in dirty and slightly less damn clothes we had worn the day before. Oddly, I thought at first, no one complained. Why would we? This was part of the mission. We were in one of the most primitive locations in Tonga. We were working in rudimentary conditions and we now had a great story to tell. More importantly, the locals opened their arms to the PP09 group. 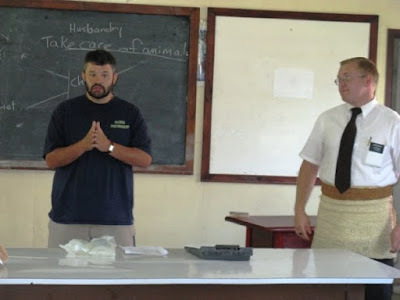 Schools offered to open their doors to host us as did a local church. The cafe and guest house allowed some of us to sleep on couches and where they could find space. Some ate out, some ate the military's MRE (Meals Ready-to-eat) field rations. We all found dry, warm places to sleep and the next day we all had smiles as we prepared to work. The Australian military did a great credit for the Vet team. As I held a styrofoam container with vaccinations, antibiotics and other things I had no refrigerated place initially to place it for the evening. The Royal Australian Navy's, Lieutenant Commander Rick Parry took the cooler and said I'll find a home for it. He advised that I find him in front of the Cafe at 6:30 the next morning and it would be cold. I am not sure how he did it but he was outside... in no better shape than I from the night before, by 5:50 making arrangements to start the day. When he handed the cooler to me it was cold. In Tonga we treated 137 animals, including 20 big animals castrations, and one pig-teet removal. We also taught 106 hours of lessons. Both Samoa and Tonga were warm hosts and fascinating places to work, sweat, teach and learn. The Pacific Partnership group, particularly the Vet group were hard working, and a gift to have been side-by-side with for seven weeks. Through World Vets' participation I have taken away some live long memories and what I assume will be long lasting friendships (the Vet team was great..I have a theory, if you work with animals you're normally a pretty good person and my theory was proven right by the Vet team). After Tonga we sailed to New Caledonia for some down-time before the mission departed for the Solomon Island, Kirabati, and finally The Marshall Islands. I wish I could have stayed on for the finals two months but I had a job to return to. I can think of no more rewarding way I could have spent those weeks and given an opportunity I would work with World Vets, which is my intention, and on a Pacific Partnership mission again. 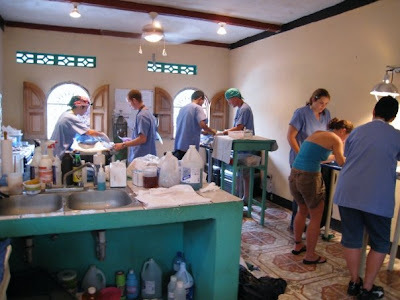 World Vets Team Granada has just returned home safely from a successful project in Nicaragua. 136 surgeries were performed, including 96 spays, one leg amputation and several tumor removals. An additional 90+ animals were treated for medical conditions. World Vets plans to provide ongoing support to this Spanish colonial city in the heart of Nicaragua. This was third team we have sent to Nicaragua this summer. Thanks to all of the local volunteers, World Vets volunteers and especially to Dr Tom Parker, Susan Paseman and Donna Tabor for all of your efforts in coordinating this project. 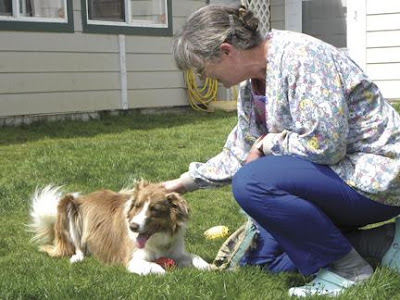 Dr Stacy Steele and her Border Collie Karoo spent a week making a 100+ mile trek around the Olympic Peninsula of Washington to raise money for World Vets as well as two local animal welfare organizations. She started the journey on August 2nd and returned home this past weekend. Steele, a veterinarian from Ocean Shores, Washington, raised over $1000 in pledges and donations for the self-initiated walk-a-thon. 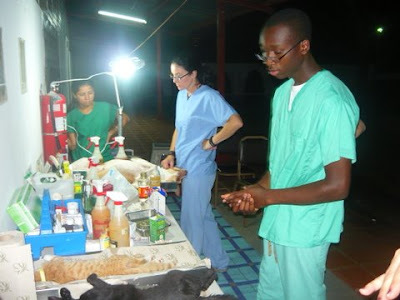 Dr Steele has volunteered with World Vets on a project in Loreto Mexico and was a huge asset to the team. She has continued to support our efforts since then and plans to be a regular on World Vets trips. Thank you Dr Steele! You are an inspiration to us all and the animals of the world thank you for thinking of them. World Vets has about a dozen project leaders who provide leadership for our international projects. 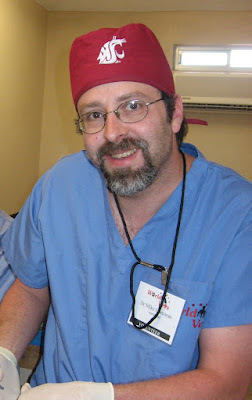 Dr Mike Corcoran, an emergency and critical care veterinarian from Vancouver, Washington is one of them. 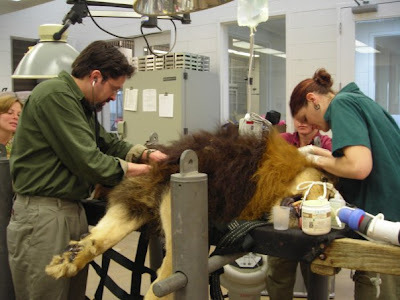 I first met Mike several years ago when I was giving a lecture to the International Veterinary Medicine class at Washington State University. After my talk, Mike came up and introduced himself and offered his help if there was ever an opportunity for him to be involved with World Vets. If I recall correctly, he was a sophomore in veterinary school at the time. Little did he know that one day he would be one of our project leaders coordinating projects and leading veterinary teams to the far reaches of the globe. Most recently, he led a group to Loreto Mexico and later this year he will be taking a group to Ibarra, Ecuador for the first of a series of spay neuter projects in that area. 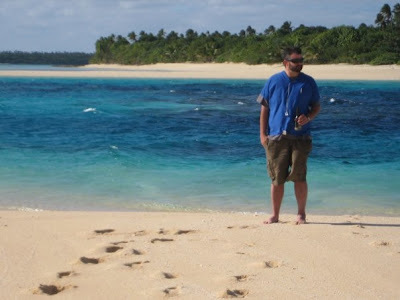 As I write this blog, Mike is in Fiji (a rough life it must be!) on vacation. 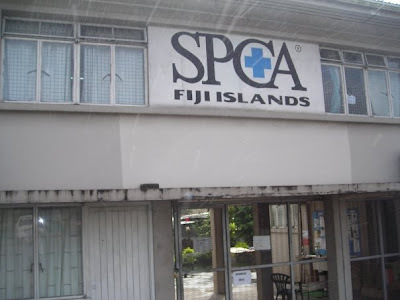 As it turns out, we had received a spay/neuter project request a couple months ago from the Fiji SPCA. 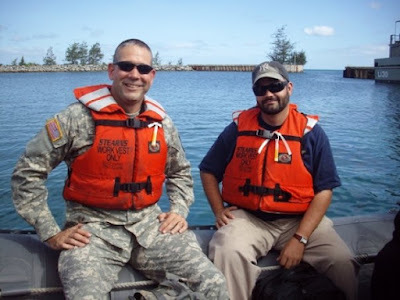 I sent Mike on a mission, while he was vacationing, to meet up with the group and see how we could help. I don't have all the details yet, but it sounds like we will be sending teams to Fiji within the next year. Thanks, Mike, for all you do for World Vets. As the years go by, I hope I will have many more stories like Mike's, of students involved in our program who later go on to be project leaders when they graduate. It's the great people we meet along the way who make World Vets what it is today. 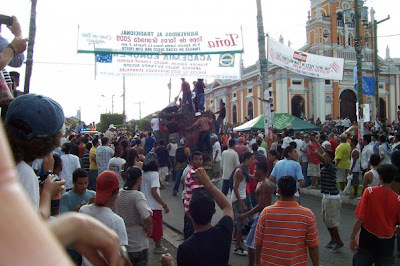 It seems like there is always some excitement on the main cobblestone street of Granada, Nicaragua. When I was there a couple months ago, there were hundreds of stallions parading down the street during Hipica, a local Nicaraguan tradition. Our newest World Vets arrived yesterday and found themselves in the midst of Granada's version of the Running of the Bulls which culminates with a rodeo rather than a bullfight, from what I understand. So instead of a relaxing day touring the city, the team had an experience they will not soon forget dodging bulls and people in the heart of this historic Spanish Colonial city. Luckily everyone survived unscathed and managed to get the supplies and equipment set up for toady's early morning start at the clinic. I suspected they were greeted with a long line of surgery patients waiting for them at Casa Lupita. Go team! Its only been a couple days since Team Panama returned home and we already have another team headed for Central America. Early this morning, eleven World Vets volunteers headed for the airport en route to Granada Nicaragua. 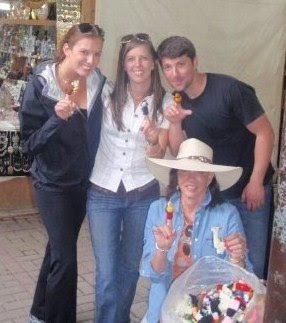 We had a team in Granada just a few months ago doing a spay/neuter clinic as well as working on horses. We had a huge turnout at both clinics and in the end had to turn away some of the small animal patients as we had run out of time and supplies with such an overwhelming response from the local community. Our Granada project, like most of our programs, strives to be sustainable by providing ongoing support. In keeping with that mission, another team is on the way! This time the team is lead by Susan Paseman and Dr Tom Parker. 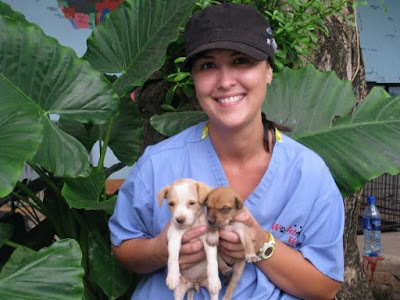 Susan is the vice-president of World Vets and has travelled with many teams to Central America. Tom Parker is a veterinarian from Santa Fe, New Mexico who I met earlier this year. Tom contacted World Vets about the possibility of starting some programs in Nicaragua (where we previously had not worked). Well, that was just 8 months ago and we have already been there four different times doing veterinary projects and have plans for regular continued support. 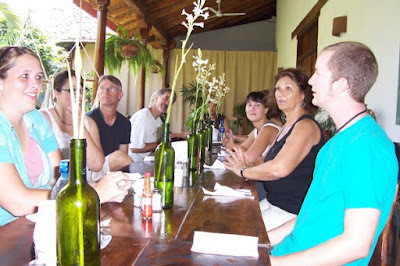 During the Granada trip, we will be working at Casa Lupita, a clinic run by Donna Tabor of Building New Hope. 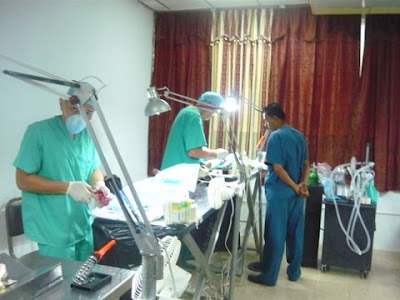 Dr Tom has worked extensively with Casa Lupita and has managed to fully outfit the clinic with equipment and supplies, one suitcase load at a time. Tom is one of the hardest-working, most dedicated people I know and is an all around great guy! Dr Tom will oversee the veterinary work on the Granada project. We wish the team good luck this week and will keep you posted on their progress. 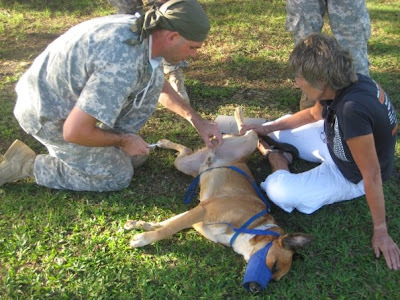 Susan Paseman, project leader and Vice-President of World Vets, working during our last Granada project in May 2009. 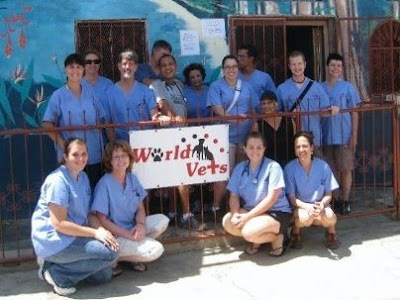 Every month, World Vets sends a team to work with our Panama division, called SpayPanama. The team arrives on Tuesday, works in the clinic in Panama City for a couple days then heads out for a weekend "spay blitz" in a remote community. 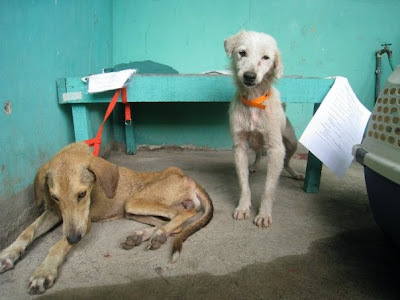 To date, over 22,000 animals have been spayed and neutered in Panama under this program. 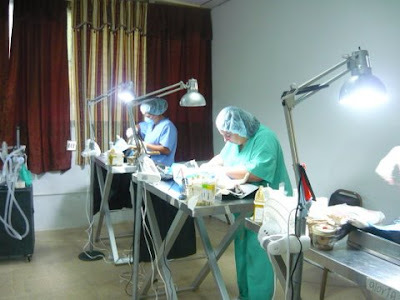 SpayPanama has become a model for what can be accomplished with a dedicated sterilization program. This months team travelled to Farallon, Panama for the spay blitz. It rained all the way there (it is rainy season!). During the weekend blitz, 241 animals had surgery (202 dogs and 39 cats). Anyone who has been a part of a remote spay blitz knows how much work is involved in doing this volume of surgery. Great job! The animals were also dewormed, vaccinated, treated for fleas and had their ears cleaned. A special thanks to Shirley Chen and Liz Pollak! Pacific Partnership is a humanitarian mission carried out by the US Navy in collaboration with NGO's, partner nations and other branches of the military. This years 4-month mission provides aid to Samoa, Tonga, Solomon Islands, Marshall Islands and Kirabati. 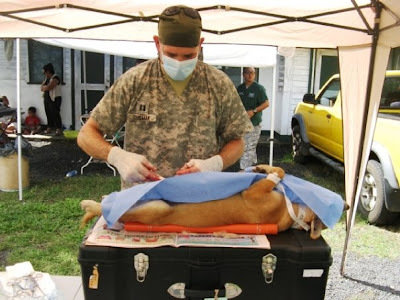 World Vets is honored to be a part of the mission and the sole veterinary NGO participating. 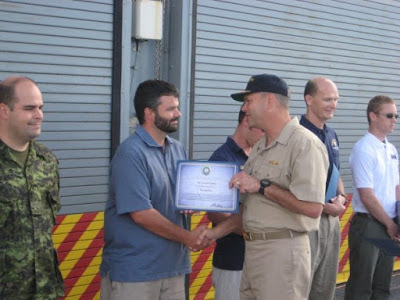 World Vets member Daniel Gildea (San Jose, California) has just returned from 7 weeks on board a US Navy ship which traveled from San Diego to the Oceania region. During his part of the mission, the group performed spays and neuters, worked on cattle, pigs and goats and provided educational programs on livestock husbandry. 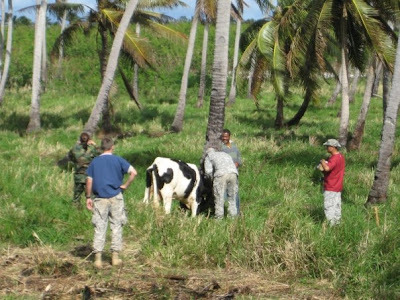 Next year, World Vets will travel with the military to South East Asia providing medical, dental and veterinary aid to the region as a part of Pacific Partnership 2010. Early next year, we will be recruiting veterinarians, technicians and veterinary students to participate in this exciting mission.